My brother and I gazing proudly at some homemade Christmas cookies. sweepingly over my shoulder with dramatic flair. I love you so much! When you sleep with me, that makes me happy. I love when you sleep in my room. Japanese! I love you, bear. I like to eat s'mores. From, Teddy"
Is the kid sweet? Most definitely. Is he a genius master of the irreverent? Absolutely! (And who knew that he understood the subtle nuances of Asian culture?) But, more than anything, what strikes me about this letter is the natural and strong connection children share as siblings. As you all know by now, I have three offspring: Bella, Charlie and Teddy. Their relationships with one another are a bit complex (actually not at all, what am I saying? ), and go something like this: Bella tolerates her two younger brothers, who eagerly abuse her as much as humanly possible. She perpetually concedes to them, because, I am ashamed to admit, I expect it of her as she is the oldest. (In the middle of the night, when I can't sleep due to my guilt-ridden thoughts, I try to reassure myself that this is okay, since she is the only girl and thus will always -- hopefully! -- have a close relationship with me, the way I have with my mother.) And I do try not to expect so much of her, but sometimes avoiding a fight or a screaming match is on the forefront of my mind, especially when we're at Target, or at, you know, a wedding. The other option that has occasionally crossed my mind is binding and gagging them when we're in public -- but, wait, would that be wrong? No, seriously, would it? Bella and Charlie sleep in Bella's room, in her queen-size bed. Weird, I know, but Charlie is afraid to sleep alone, and, actually it's kinda sweet. I know this has to stop sooner rather than later since they're getting so big, but I keep remembering when I was little and slept in my brother's room until I was, oh, 16 or so (OK, but don't worry, we had twin beds, and we only made out twice). I think Charlie feels safe with his big sister, and I love that about their relationship. I also love it when they share precious childhood predicaments with one another, like the stomach flu and head lice. That's goooood stuff. Now, Charlie and Teddy, on the other hand, are like two scrappy puppies. They rough-house, scream at each other, punch each other in the guts, say sorry, hug, and start the exhilarating cycle all over again. I watch these rousing matches deadpan, as nothing phases me anymore. Even when Charlie pushed Teddy off the seesaw and broke his arm, I kept telling Teddy, "You're fine, now let Mommy finish checking her facebook," until I noticed one of Teddy's arms was hanging down two inches lower than the other one. My awareness of this, meanwhile, happened a good 24-hours later. That's right, people, I am ON it. I have three siblings, myself. My younger brother, Andy, and my two older half-sisters, Jennifer and Julie. Since I only grew up in the same household as Andy, I can really wholly comment on my relationship with him, as sibling dynamics are naturally more extreme when you are fighting over who gets to pick the T.V. channel (out of 13, of course), who gets to shower first (and Andy's were f-ing long! ), or whose turn it is to play Jumpman on the Commodor 64. (Just to interject, I am also very close to my big sisters, and they are not only dear siblings, but amazing friends, as well. I am lucky to have them!) Anyway, Andy and I are five years apart, but that didn't seem to get in the way of our childhood kinship. Because my parents travelled with us so much, we were forced to be cramped in cars and hotel rooms together for inordinate amounts of time, and naturally we were friends, as well as foes. 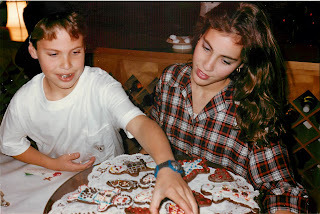 Andy and I could fight like nobody's business, as all siblings can, but we could also play together for hours on end. I remember putting on charming -- though efficient -- Izod rain ponchos with him, and tramping for hours through our muddy property during rainstorms. (What we were looking for exactly, I have no earthly idea, but I think Andy did retrieve a piece of petrified poop one time, although I still claim that this was actually just a rock.) We would play afternoon-long games of hide and seek (my all-time best hiding spot was the clothes dryer, the only problem was it was too good, and I got stuck in there for 45-minutes. It's a miracle I'm not more claustrophobic than I am. ), and, when we outgrew that, we turned to Scrabble (and he's good -- who knew?). Andy is gruff on the outside and all mush on the inside. He's smart, mischievous (he used to tape record me and my boyfriends in our orange groves, and then play the recordings at the dinner table -- yikes, cringe! ), and kind of looks like a male version of me, but with lots more tattoos. Andy's a little bit on the reserved side, whereas I'm a huge communicator (as if you haven't already guessed), but we will always have that unspoken sibling connection with each other, no matter what. The guy has been through a lot, come out the other side, and is an outstanding father and friend to many. I respect him to no end, and I feel blessed that he is in my life. And, what I have realized, is that as much as I try to force him to connect with me, the connection is already there, and always has been. I can only hope that my children grow up with such fond memories of each other as I have with my brother, Andy. So, Bro', I love you, I'm proud of you, and I'll never try to push you in the pool again. Maybe. I love watching my daughter and son building their relationship (except when it involves screaming/crying/whining). I am endlessly curious how they will get along as adults. I enjoyed reading all your observations!